Summer has come to mean many things: beach vacations, long days in the sun and even outdoor celebrations. However, if you are planning to host a barbecue, birthday party or just an impromptu bash, it is important to remember that your event can be environmentally friendly. The following tips will help you enjoy your celebration while still being mindful of the Earth at the same time. Whenever you can, refrain from using throw away plates, forks, knives, spoons and cups. If reusable items simply aren’t a possibility for your gathering, make sure to purchase disposable products that were created from recycled materials. Keep in mind, too, that a “compostable” product isn’t going to do you (or the Earth!) much good unless you have a way of getting it to a compost pile. Balloons cause a lot of issues for the environment. 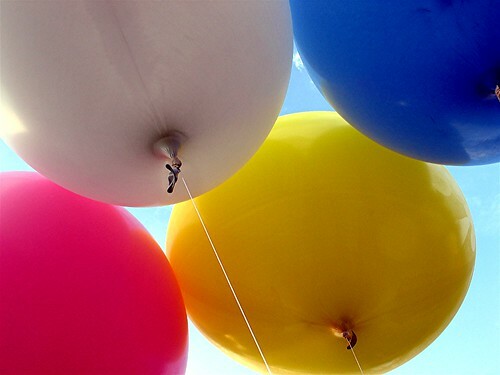 If you decide to celebrate with helium balloons, take care to dispose of them properly. They should never be released outside, because you don’t know where they might end up. For example, if you live near the shore, balloons can travel and slowly deflate down into the water. Ocean animals often confuse balloons with food, as they look very similar to jellyfish. Eating a plastic product like a balloon usually means certain death for marine life. The ribbons on your balloons also need to be carefully placed in the trash can. If birds have access to these ribbons, they will usually pick them up. From there, it isn’t uncommon to find birds that have been inadvertently strangled by the ribbons. Rather than adorning your tables with plastic centerpieces that will just wind up in the trashcan, put fresh flowers on the tables instead. If you want to give your guests a favor at the end of the party, choose potted plants to serve as your centerpieces. Your guests can take these flowers with them and re-plant them in their own yard. Since the hallmark of a good party is great food, it is important to think carefully about what you want to serve to your guests. To be as environmentally friendly as possible, pick up food from local vendors. You should be able to purchase fruits and vegetables, as well as wine, cheese and bread, from a seller in your area. Not only are you helping the environment when you do so, but the food will be much fresher and often more delicious as well. Use local businesses in other ways, too. If you find bees nesting on your property, or if you have an ant invasion prior to the big day, ring an Odessa pest control company to help you take care of the problem. You may even want to employ the services of a green cleaning company to get your home in tip-top shape prior to the gathering. Summer is a great time to host a get-together with your friends and family. By making a few small changes to your party plans, however, you can ensure that your celebration is not only fun but is also an eco-friendly event as well.